Truckee (AO-147) was laid down in December 1953 at Camden, N.J., by the New York Shipbuilding Corp.; launched on 19 March 1955; sponsored by Mrs. Murrey L. Royar; and commissioned on 18 November 1955, Capt. Joseph W. Leverton in command. Assigned to the Atlantic Fleet, the new oiler reported for duty with Service Squadron 4 off Norfolk in January 1956 and spent February in the Caribbean. In May, she carried fresh water, her first cargo, to Bermuda and the following month got underway for her first transatlantic voyage. With a group of midshipmen embarked for training, she steamed to Copenhagen and through the North Sea; then stopped at Sheerness, England, before turning to the United States. On 19 September, she departed Norfolk; set her course southward and, throughout October, acted as flagship and supplied fuel and repairs for a hydro-graphic survey group operating in the vicinity of two South Atlantic island groups-Ascencion Island and Fernando de Noronha. In November, she returned to the Virginia capes and, before the year was out, had ranged as far as Portugal serving the fleet. In 1957, she continued to ply the waters of the North Atlantic and Caribbean until August when she again headed south to operate with the Atlantic Survey and Cable Group in the mid-South Atlantic. In addition to her regular duties, Truckee served as flagship on this operation. She returned to Norfolk in April 1958 and, in June, sailed for European waters. She stopped at Portuguese, Norwegian, and British ports before returning to the United States in August. Truckee operated out of Norfolk throughout the remainder of 1958 and during the early months of 1959. In June 1959, she took part in refresher training out of Guantanamo; then, in August, moved north to fuel ships providing support for President Eisenhower's air trip to Europe. Late in the month, she stopped at Greenock; and she returned to the Norfolk area in September. The oiler remained with the 2d Fleet into the new year, conducting a midshipman cruise in the summer of 1960 and steaming northward in the fall to take part in NATO exercises inside the Arctic Circle. Truckee then headed southward to warmer climates and welcome Mediterranean ports. The oiler spent Christmas and New Year's at Cannes and continued her de- ployment with the 6th Fleet into 1961, making over 160 fuelings at sea between November 1960 and February 1961. Into the 1960's, Truckee alternated 6th Fleet Mediterranean cruises with 2d Fleet duty in the Atlantic. On her Mediterranean deployment which began in February 1962, the oiler served as flagship, Commander, Service Force, 6th Fleet. 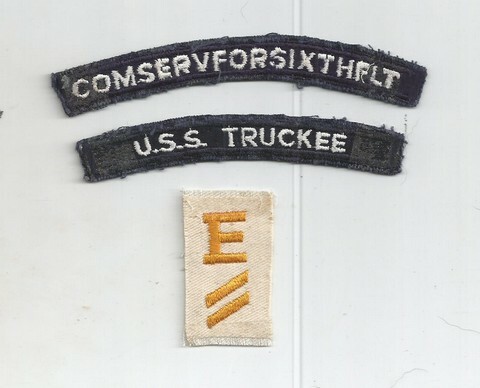 During the Cuban Quarantine operations in the fall of 1962, Truckee fueled 152 ships in 50 days, while serving as flagship for Commander, Service Squadron 4. In 1963, while continuing her regular round of duties with the 2d Fleet, she was awarded the Golden "E" since she had won the Battle Efficiency Award for five consecutive years. In 1964, she participated in NATO Exercises "Teamwork" and "Masterstroke" in the North Atlantic; and, late in the year, she underwent 10 weeks of yardwork at Baltimore to provide adequate accommodations for the extra staff she would carry when used as a flagship. On 1 March 1965, Truckee departed Norfolk for an eight-month deployment in the Mediterranean. During this cruise, she served as flagship for Commander, Service Force, 6th Fleet, participated in several major exercises, fueled over 400 ships and visited ports in five countries. On 6 November, she returned to Norfolk and rejoined the 2d Fleet. In 1966, she received her eighth consecutive combat efficiency "E" award, but her activities were curtailed in mid-summer when she began an extensive overhaul at Norfolk, which was not completed until the new year. In January 1967, the oiler conducted refresher training out of Guantanamo Bay, Cuba; and, late in March, set her course for the Mediterranean, supporting the 6th Fleet and serving as Service Force flagship. In May, tension mounted in the Mideast as Arab-Israeli relations grew increasingly abrasive. On the morning of 5 June, Truckee was fueling carrier America (CVA-66) when word came that war had broken out between these two mideast neighbors. Truckee provided fuel and coordinated the support which enabled the carriers and their escorts to remain on station during this explosive situation. Although the technical research vessel Liberty (AGTR-5) was mistakenly bombed and torpedoed by the Israelis some days later, American military involvement was limited to maintaining readiness during the tense situation. After the crisis subsided, Truckee returned to Norfolk in September and participated in NATO exercises during November. In the first half of 1968, Truckee alternated upkeep and Caribbean cruises. The oiler was damaged by a collision with Wasp (CVS-18) which occurred in June while she was removing fuel from the carrier. In July and August, Truckee underwent repairs at Norfolk and, in September, got underway for the Mediterranean. During this deployment, she fueled 158 ships, visited seven countries, and pumped 35 million gallons of fuel before returning to the United States in April 1969 for fleet operations on the Atlantic coast and in the Caribbean. Later in the year, she underwent overhaul and took part in refresher training out of Cuba. She began another Mediterranean deployment in April 1970 and embarked 6th Fleet's Service Force Commander at Rota. Again, as in 1967, Truckee was on the scene when new violence threatened in the Mideast. From 9 September 1970 until 8 October, the tanker supplied the naval forces standing off the coast of Israel during the Jordanian Crisis. Pumping day and night during 27 of her 30 days at sea, she earned the Meritorious Unit Commendation for her fine performance. On 18 November, Truckee returned to Norfolk and began the conversion of her plant to burn Navy Distillate Fuel. The oiler plied the Atlantic from Nova Scotia to the Virgin Islands in 1971, supporting NATO and Atlantic Fleet operations. She participated in Exercise "Rough Ride" in June. After that 10-day NATO exercise involving ships from five countries, she supported a NATO sea power demonstration off Norfolk in September. February 1972 found Truckee again underway, via the Caribbean, for the Mediterranean. At the end of this deployment with the 6th Fleet, she returned to the east coast in November and, at year's end, had pumped a total of 50 million gallons of fuel. On deployment with the 6th Fleet again in 1973, Truckee provided support during yet another Middle East crisis, the October War. After an emergency sortie from Palma on 7 October occasioned by the heaviest Arab-Israeli fighting since 1967, Truckee remained in the eastern Mediterranean until ordered to standdown from alert posture on 18 November 1973. During this cruise, the tanker pumped 25 million gallons of fuel to NATO and United States ships and steamed 25,000 miles. In 1974, Truckee remained on the east coast operating out of Norfolk. She also underwent an extended overhaul which took seven and one-half months and was not completed until January 1975. In the summer of 1975, she participated in Exercises "National Week" and "Dawn Patrol" in the eastern Mediterranean. Later in August, she shifted operations to the western Mediterranean before departing Rota in October at the end of her 10th Mediterranean deployment. On 3 November, she returned to Norfolk for overhaul. In February 1976, she returned to duty with the 2d Fleet operating out of Norfolk with occasional visits to other east coast ports. Second Fleet operations took Truckee to Guantanamo in May and to Puerto Rico in July, and she continued local operations out of Norfolk for the remainder of the year. The early months of 1977 were spent in preparations for Truckee's forthcoming deployment to the Mediterranean. She departed Norfolk for operations with the 6th Fleet on 31 March. Following six months of providing fuel to units of that fleet, Truckee returned to CONUS, arriving in Norfolk on 21 October. A two-week, post-deployment standdown was followed by an availability devoted primarily to overhaul of the ship's entire Mk 56 gun fire control system. The close of the year found the fleet oiler in her home port. During the period 6 January to 11 July 1978, Truckee conducted operations in the Caribbean on four separate occasions. An upkeep followed; and then, on 25 August, Truckee departed Norfolk for a two and one-half month deployment to the North Atlantic. Port visits during the deployment included Rotterdam, Netherlands; Kiel, Germany; and Lisbon, Portugal. The ship returned to Norfolk on 30 October, and she continued local operations out of that port into 1979.